On Midnight, Texas Season 1 Episode 10, as Hell is literally about to erupt onto Witch Light Road, Manfred leads the Midnighters to take back their home. 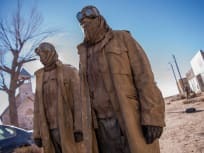 On Midnight, Texas Season 1 Episode 9, Bobo vows to protect Fiji from a demon whose arrival is concealed when an apocalyptic sandstorm engulfs Midnight. "The Last Temptation of Midnight"
On Midnight, Texas Season 1 Episode 8, a faceless supernatural makes a pilgrimage to Midnight to usher in the arrival of a demon from the veil to Hell. On Midnight, Texas Season 1 Episode 7, the sins of Joe's past puts Midnight in the crosshairs of an ancient feud. Creek tries to recover from her family tragedy. 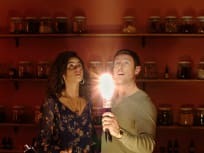 On Midnight, Texas Season 1 Episode 6, when a local girl goes missing, the Midnighters try to find her before law enforcement descends into town. On Midnight, Texas Season 1 Episode 5, Manfred's growing relationship with Creek is threatened when his con-artist past finally catches up with him. On Midnight, Texas Season 1 Episode 4, Manfred sees an ancient supernatural who seduces and feeds on men, while Bobo confronts dangerous bikers. On Midnight, Texas Season 1 Episode 3, deadly vampires arrive in town, but they are friends of Lem's, but Manfred worries there's more to their visit. 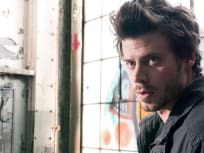 On Midnight, Texas Season 1 Episode 2Manfred tries to help one of his new neighbors, Bobo, clear his name by talking to the murdered victim with the help of Joe. As Manfred helps his neighbors and grows closer to Creek, they help him - specifically, Fiji, the resident witch who performs an exorcism to rid Manfred's home of the spirits, demonic and otherwise that haunt it. On Midnight, Texas Season 1 Episode 1, locals from a small Texas town must fight off supernatural beings, and violent biker gangs on the series premiere.